When we lived in St. Raphael, one of our favorite meals was a pan bagnat bought at the beach. 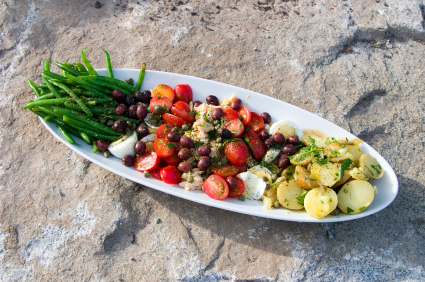 Now that we’re back Stateside, this perfect summer salad always reminds us of being very tan and able to swim in the Med all the way up until November, at least! 2 roma tomatoes, seeds removed if you want, and chopped. 1/2 a red or Vidaylia onion, chopped. 1 cucumber, chopped or cut in thin rounds. Lettuce of your choice. I like Green Leaf or Romaine. 1. Prepare the dressing by whisking together in a large bowl the oil, vinegar, mustard, salt, pepper, herbes de provence and pressed garlic. 2. Boil the eggs. To get a good hardboiled egg, bring the cold water to a boil with the eggs already in the pot. Turn off the heat and let it sit, covered for 9 minutes or so. The aim is to have yolks that have just set and avoid the greenish cast that signals overcooked and not as tasty…. When they cool, quarter and salt them. 3. Boil the potatoes, drain, quarter and salt them with the skin on. 5. Flake the tuna from the can and add to the bowl with the oil. Toss in a dash of lemon juice to offset the extra oil. If using fresh tuna, grill with a basting of olive oil and dash of lemon juice. Cool and cut into strips. Present the salad one of two ways, like the one in the image above, you may group all the elements together on a cool plate for a deconstructed look or you may mix everything together and serve in a bowl. Just make sure that everyone gets a bit of each of the goodies. Take any leftover salad (or make new!) heap in the middle of a round loaf of peasant’s bread that has been rubbed with a cut clove of garlic. Drizzle with more olive oil. Cut into quarters and serve!